Don't let your home be damaged by a washer leak. These one piece pans hold up to 9 gallons of water and come seamless to prevent any leaks. Save yourself from future hassle. 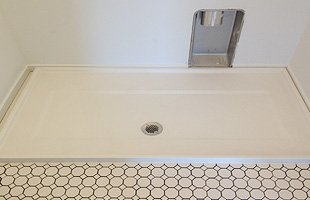 Designer Marble can install utility bases in your home with or without drains. Allowing our experts to save you from damaging leaks, will save you money in the future.